SELF-exiled G40 cabalist Professor Jonathan Moyo yesterday tore into former First Lady Mrs Grace Mugabe while revealing a nasty fall out between the two that led to the latter blocking him from all her communication networks in June. Prof Moyo, who along with other key G40 figures like Mr Saviour Kasukuwere and Mr Patrick Zhuwao, fled the country last year after the security forces launched Operation Restore Legacy targeting criminals around former President Mr Robert Mugabe. While in self-imposed exile, Prof Moyo has been the most vocal of the G40 cabalists spewing venom on Twitter against the President Emmerson Mnangagwa-led Government and at times purporting to speak on behalf of the Mugabes. However, following the Mugabes’ endorsement of President Mnangagwa last week and in particular Mrs Mugabe’s call for people not to insult President Mnangagwa on her behalf, Prof Moyo issued a statement yesterday attacking the former First Lady. The Prof Moyo/Mrs Mugabe spat could signal the collapse of the National Patriotic Front (NPF), a party formed by G40 remnants with reported blessings from the former First Family. In his statement, Prof Moyo revealed that he last had communication with Mrs Mugabe on June 10 after she blocked all communication with him. He said the fall out was caused by his objections to Mrs Mugabe’s alleged wishes to lead the NPF and also be seconded as Vice President of a coalition with the Mr Nelson Chamisa-led MDC Alliance ahead of the July 30 elections. “She did this in an angry response to advice I had respectfully and privately offered to her in writing, against her toxic and polarising wishes to lead the National Patriotic Front (NPF) in general and, in particular, against her then active but divisive push to be seconded by the NPF as a vice president in what had been proposed as a Grand National Union (GNU) of opposition forces ahead of the 30 July election. My contact with Mrs Mugabe was slim prior to 10 June, and none since then,” Prof Moyo said. He claimed that the former First Lady did not command support in G40 circles. “I consider it an insult that some circles, especially in the media, refer to some leaders who worked with and supported President Mugabe as followers of Mrs Mugabe. “That’s not only false but it is also nonsensical. Mrs Mugabe cannot be a leader simply because she’s the spouse of our iconic founding leader. 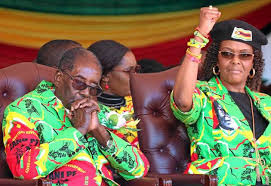 President Mugabe himself has said on many occasions, including during the funeral of Ambuya Marufu, that Mrs Mugabe could not have been his chosen successor because she lacks political experience to be a national leader. Mrs Mugabe’s lack of political experience has always been self-evident and is known by everyone who has interacted with her,” Prof Moyo said. “It is an absurd corruption of public morality, values and ethos for Mrs Mugabe to claim that Mnangagwa’s gesture to hire a fancy private plane to fly her from Singapore and to pay for her mother’s funeral constitutes a political paradigm for the country to move on,” said Prof Moyo. “Narcissism cannot be the basis for politics. Mrs Mugabe was indeed well within her rights to thank Mnangagwa for assisting her family at a time of need, but she had no rhyme or reason or right to turn that into a national cause. However, Prof Moyo was dismissed by NPF spokesperson Mr Jealousy Mawarire who said his fall out with the former First Lady had nothing to do with the things he raised in his statement. He threatened to expose the Prof Moyo cartel which he accused of extorting people money on the pretext that they were raising funds for Mr Chamisa’s legal team after his failed bid to challenge the Presidential elections at the Constitutional Court. Posting on Twitter, Mr Mawarire said: “While @ProfJNMoyo <https://twitter.com/ProfJNMoyo> is within his right to criticise anyone whom chooses to, it’s his past time, he has to be truthful throughout. One day, his reason for the fallout with Mai Mugabe will be told, and it’s never about Mai Mugabe wanting to be NPF president, she never wanted.